Each year, Pavé previews the upcoming road season with a countdown of the top-20 teams in the sport. Today we pick things up with #11. 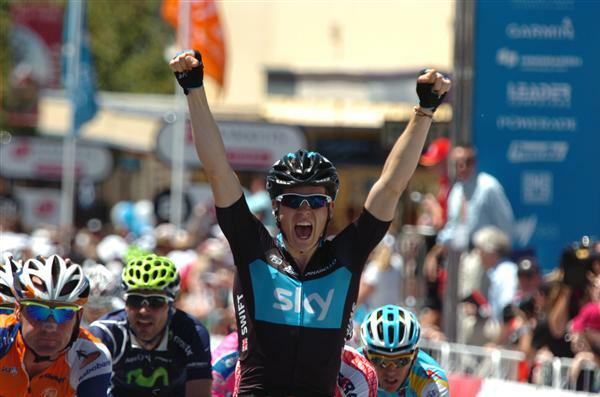 In 2010, Sky wanted to win the Tour—and we all know how that went. In 2011, they just want to win—as much as possible. And while it’s easy to forgive the team for over-hyping itself heading into last season, the pressure’s on to show there’s more to the team just money and mouths. We’ll get our first indicator of Sky’s fortunes at this year’s cobbled classics where Juan Antonio Flecha and a healthy Edvald Boasson Hagen will lead the way. Flecha won the Omloop in 2010 and B-H won Ghent-Wevelgem in 2009. While another win in these events would be a welcome sight, Flanders and Roubaix are bigger targets. For some reason or another, I see this being Flecha’s year in Roubaix. While Garmin, Leopard, Quick Step, and BMC stare at one another, I think he sneaks away for the win. Just a hunch. As for B-H, he’s not done there. The Norwegian had a disappointing 2010 compared to his 2009 exploits—but he still won several races and finished the year ranker higher than you would have expected. At only 23, it’s still hard to say where the kid’s real talents lay—classics, time trials, short stages races, or all of the above? For now, he’ll win whenever and whatever what he can, hopefully adding a Tour stage to his burgeoning résumé. In the Ardennes, Simon Gerrans and Rigoberto Uran will likely lead the squad, while the rest gear-up for the season’s first Grand Tour. Thomas Lokvist and Michael Rogers will also get chances to win shorter stage races before working with Wiggo to try and pull a result in the Tour. If the team learns from its 2010 mistakes, they’ll put in a better performance. Overall, there’s really not a weak rider on the roster, and with an average age of less than 29, the future looks bright. Adding talented role players such as Jeremy Hunt, Christian Knees, and Davide Appollonio also means Sky’s imports far surpass their exports. In the end, Sky might want to stop looking to Garmin and start looking at HTC as its model of success. HTC’s spent the past several years winning every race it can, putting its sponsors in the limelight on an almost daily basis. As a result they have become one of the world’s two or three best teams despite winning only one Monument and placing only one rider on the podium of a Grand Tour. A little shift in its game plan, and Sky could easily reap similar rewards. Man of the Hour: The other day I compared Bjorn Leukemans to Peter Van Petegem right before he won his first cobbled Monument, claiming he needed a breakthrough win—such as the Omloop Het Nieuwsblad—to set him on his way. In hindsight, maybe those thoughts were best reserved for Juan Antonio Flecha—after all, he won last year’s Omloop before finishing third at Roubaix (his third trip to the podium). If De Peet’s trajectory is an accurate predictor, Flecha’s due. On the Hot Seat: Wiggins and Gerrans did a lot of talking before moving to Sky. Unfrotuantely, they did little in 2010 to justify the team’s investment. Sky would look foolish to let go of Wiggo after only two seasons—but Gerrans? I’m not so sure. Up-and-Comer: Geraint Thomas enjoyed an impressive 2010, wearing the points jersey in the Dauphiné before winning the British National Championship. At the Tour, he finished fifth in the Prologue and second on the cobbled stage to Arenberg, results that gave him the white jersey as best young rider for a few days. But the result that most impressed me was the Welshman’s overall finish in the Dauphiné: 21st. Could this trackie/sprinter/former junior Roubaix-winner/future classics star have a little bit of GC potential in his legs? At 24, there’s lots of time to find out. Best Pick-Up: Rigoberto Uran just turned 24—and this will be his fourth season as a European professional. His 2010 résumé is the kind with a bite louder than its bark. Few results stand out, but several hint at the Colombian’s potential: 12th at Lombardy, 9th at Piemonte, three top-10’s in Vuelta summit finishes, 7th overall at the Tour de Suisse. Sky’s on to something good here. Biggest Loss: None of note—Sky lost only 3 riders this past off-season. One to retirement (Portal), one to Leopard Trek (Vigano), and one to obscurity (Calzati). Your thoughts on Sky? Share them below. This entry was posted in Featured, Teams and tagged Boasson Hagen, flecha, rogers, team sky, thomas, wiggins. Bookmark the permalink. I think equally important to Sky in 2011 will be the addition to the backroom staff. They suffered after losing Scott Sunderland last year and at the later races were relying on Rod Ellingworth and Dan Hunt to do DS duties. The addition of Servais Knaven will have an impact, and Portal will now be a DS on the team. Bobby Jullich brings a massive amount of experience as well and will be very important. Jullich and Knaven are as important to the team as a couple of new riders. While Sean Yates will have a bigger role this year with Dave Brailsford stepping back a bit from day to day team management. Everyone's favourite domestique not named Jens will be back in action again this year. I am anxious to see how Barry performs with the ongoing cloud of accusation hanging in the air post-Landis verbal carpet bombing. I'd like to see him, just once, put himself before his domestique duties and go for a well deserved win in what will most likely be his final season. He is a class rider who does things right and is as talented as many other teams protected riders in one day races, which he has proved several times riding for the Canadian National Team at Worlds and the Olympic Games. On the staff note mentioned above, I still can't believe Riis let Julich go. Also surprised Leopard did not immediately pick him up. There is more to that story than we will ever know. Nice summary and TSF beat me to it with the comment about staff, Knaven and Julich are assets. Portal remains to be seen, he's a very nice guy with a big interest in fashion. Not the typical "angry man behind the wheel" DS. I see Team Sky as Garmin 2009/2010, before the infusion of the Cervelo guys. A good team with lots of hopefuls, but really only one guy who is a sure thing to deliver some big wins in Edvald. Similar in a way to Garmin with Farrar in 2009/2010. Flecha is a great rider, but limited in his ability to deliver a knockout punch at the end of a classics race (Het Nieuwsblad was an exception). Gerrans is an opportunist attacker, and maybe profited in 2008 and 2009 by being slightly less marked. Now he has a rep as a stage hunter and potential Ardennes winner so he is much more marked. Greg Henderson is a great personality but at the Pro Tour level he is a B-class sprinter. I am interested to see how Ben Swift develops though. In terms of GC guys, Wiggo, Rogers, Lovkvist – the latter two seem to suffer from the "jour sans" syndrome in the 3-week races. Wiggins has to prove that 2009 was not an aberration, and that is still a heavy burden to shoulder. Call me skeptic, but I don't see Sky delivering much more in 2011 with the exception of EBH if he's healthy all season.